As the more colorful weather forecasters would say, winter still has its icy grip on us! A new storm is forecast to impact the Midwest, Southeast and East this week, while we in the west are finally getting serious rain! 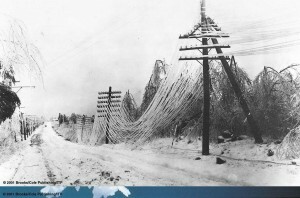 Which brings us to the topic of freezing rain. The city of Atlanta was brought to its knees a few weeks ago courtesy of freezing rain and other winter precipitation. And then just two weeks later the same happened in Rayleigh, NC! I guess they didn’t watch the news from Atlanta! So what is this mysterious thing called freezing rain? How does it form and why does it wreak so much havoc? Let’s start by talking about supercooled water. In school we learn that water freezes at 32oF (which is the same as 0oC or 273K). But really – it doesn’t, or at least not necessarily, and certainly not necessarily in the atmosphere! If we take highly purified water droplets in a laboratory and cool them down, they can remain liquid – in other words unfrozen – down to temperatures reportedly as low as -55oF (read this report)! What this illustrates is the fact that it is very difficult for water to spontaneously freeze! Instead, the liquid droplets need help for freezing to take place. In the case of a liquid water droplet in a cloud, impurities in the water may play the role of “seeds” around which liquid water can freeze. These “seeds” spark the process whereby the water molecules crystallize and form an organized lattice structure (i.e., ice). Examples of these impurities include dust, soot, and bacteria! Supercooled liquid droplets can also freeze when they come into contact with a surface, and that’s where problems start for us. A well-known example involves aircraft icing. This is where supercooled droplets freeze onto the leading edge of the wing of an aircraft as the airplane flies through the cloud. Ice therefore deposits onto the wings, and changes the aerodynamic properties of the airplane. The ice can make a stall more likely (unless the pilot adjusts for it) – and nobody wants to be in an aircraft when it stalls in midair! To cope with this, larger aircraft have heaters on the wings to prevent ice build-up. This is also why your aircraft is de-iced before takeoff when meteorological conditions are favorable for icing to occur. You’ll notice that aircraft de-icing is a winter event! De-icing is rare in coastal California, but a very cold air outbreak in early December 2013 meant that San Jose airport had to haul out its de-icing equipment (SJ Mercury new article). A second way in which supercooled water can impact us is via a freezing rain storm. There have been a number of these this year (east of the Rockies), so let’s see what happens. The process of forming rain or snow is generally very complex. Inside a cloud we often find a mixture of ice crystals, liquid water droplets, and supercooled liquid droplets. This mixture is being stirred by air motions within the cloud, and of course the cloud itself is usually moving with a storm system! Around and inside the cloud, various transformation processes may be underway: near the edges of the cloud, liquid cloud droplets might be evaporating into the surrounding clear air. Inside the cloud, ice crystals might be growing, but some may also be melting; some liquid droplets may be freezing, while others remain supercooled. As you can see, life is very complicated inside a cloud!! It is well-established – but perhaps not well-known – that in our latitudes and especially in winter, precipitation starts in the form of snow! So the raindrops that fall on your head may have been snowflakes a few minutes earlier up in the cloud! Ground-level temperatures in coastal California are rarely below freezing, so that snowflakes simply melt on the way down. This is the “normal” situation, and occurs whenever air temperatures get colder the higher up we go in the atmosphere (as is usually the case). Back to our layers…freezing rain happens when that lowest layer of cold layer is shallow. Recall that snowflakes have fallen from the cloud, have melted into liquid drops below the cloud, and are still falling (gravity!) They now fall into this shallow cold layer right above the ground, and start to cool down again. They become supercooled, but since the layer is shallow, the process of freezing doesn’t have time to complete – and hence we get supercooled droplets hitting the ground! And as soon as these supercooled droplets hit something, they freeze! Here’s a link to a nice animated cartoon of how these types of precipitation (snow, sleet, or freezing rain) form – take a look! What can our supercooled droplets freeze onto? How about power lines! As a result of this, power lines get coated with ¼” or more of solid ice, as the photos below show. The added weight is usually enough to bring down the lines and poles. 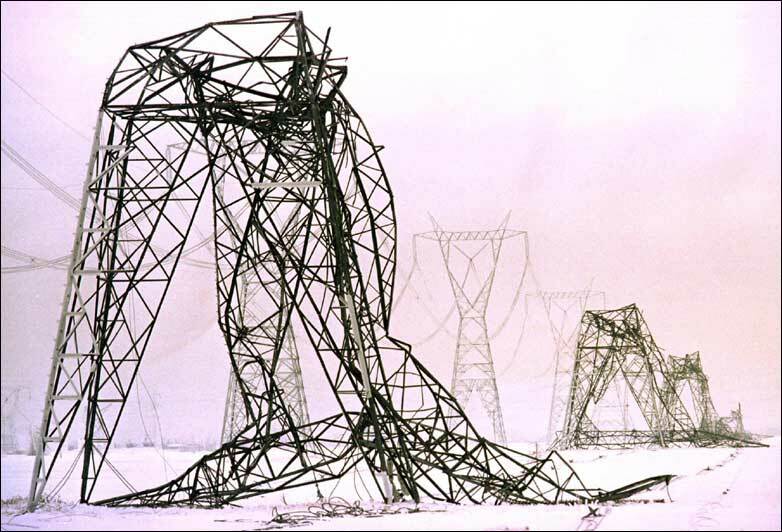 If just one line goes out, it gets fixed fast, but when an ice storm brings down ALL the power lines in your town, you’re gonna be without power for some time. 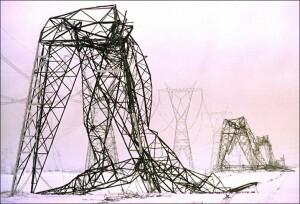 In a huge ice storm that hit Quebec in 1998, even the largest power transmission towers came down (see the photo below). 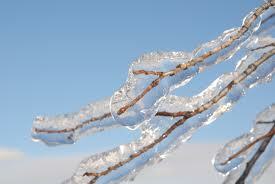 Freezing rain also forms a layer of ice on trees, adding extra weight to branches and causing them to snap off. They too fall on and bring down power lines, so now you have no power AND the roads are blocked by downed trees. Freezing rain also forms a sheet of ice on the roads themselves – this makes driving quite challenging as your tires completely lose their grip on the road! And in any case – and in my personal experience – it’s tough to even get in your car since it is coated with ice when you try to get in it! 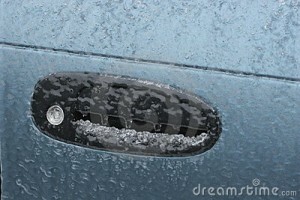 In a keyed car the keyhole is iced over! And if you can get the key in the car, the doors are iced shut and you can’t open them! And if you can get the doors open and get in, the wipers are frozen to the windows! And if you can manage to get the car moving, you probably can’t stop! The fun never ends with a freezing rainstorm! We in lowland California should be grateful that we don’t get these storms, and if you’re ever visiting back east in winter and one of these storms hits – stay indoors! 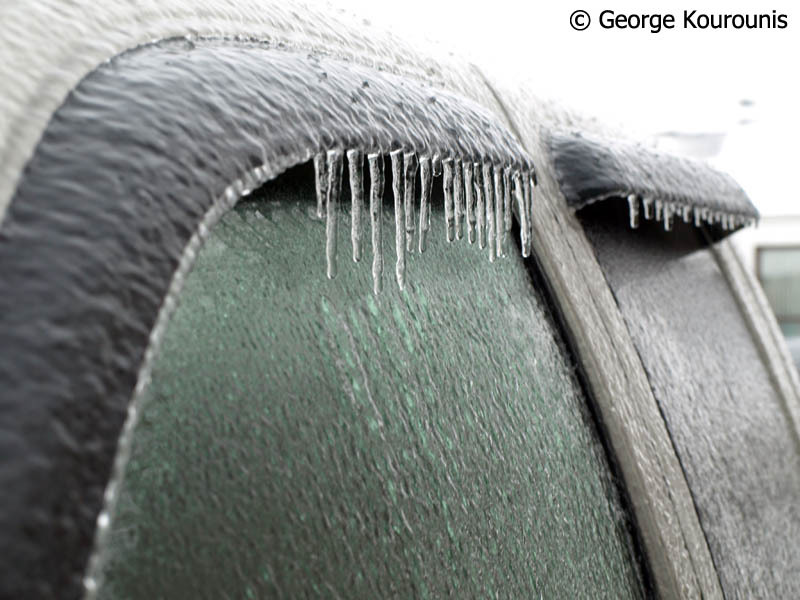 Below is a series of photos showing just some impacts of freezing rain. And here’s a short video of somebody trying to get into their iced-over car with a hammer! Comments Off on A Freezing Rain Primer! January 26, 2014 – and still no rain has fallen in what should be one of our rainiest months. As of today, we’ve gone 50 DAYS since the last measurable rain in San Jose – incredible!!! Incredible given that December and January are the peak rain months for us. 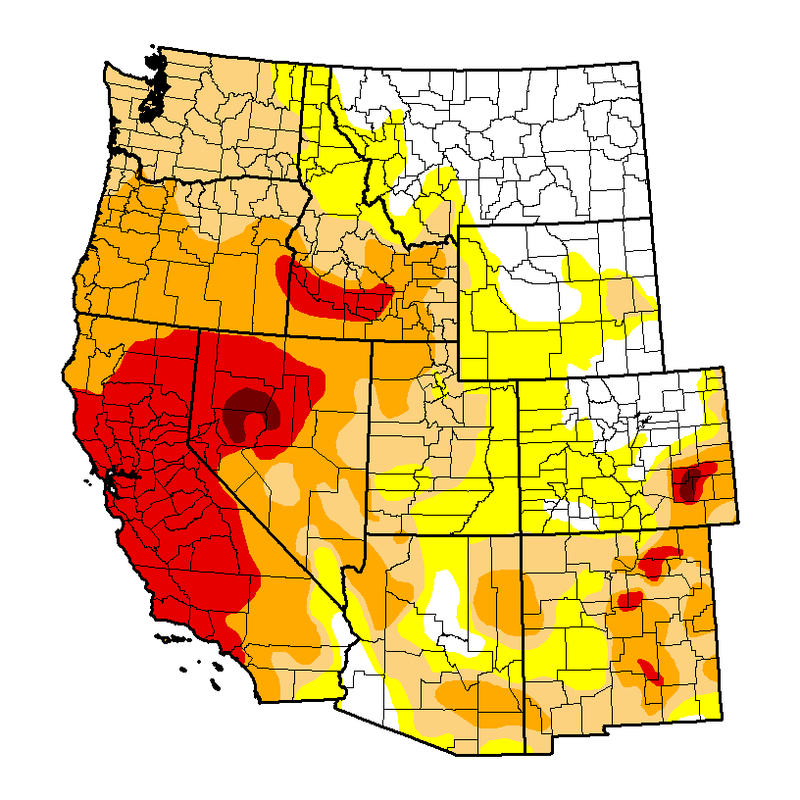 Impacts of the drought are all around us. This link shows a gallery of photos of area reservoirs and lakes, some of which are almost empty! Word is also spreading about the drought. Although we in the Department of Meteorology & Climate Science have been talking about the lack of rain since around Thanksgiving, it’s only in the last 1-2 weeks that the rest of the nation have started to notice. Not surprising given the “polar vortex” and relentless cold weather back east. Here’s how the BBC (in England) sees it. Why do we care? For those of us in urban areas who rely on water from the faucet for showers, cooking etc., think about where this water comes from… According to the San Jose Water Company: 50% of our water supply is imported and mainly originates as snow melt from the Sierras; 40% originates from local groundwater sources; and 10% is from reservoirs which capture rain in the Santa Cruz mountains. As the photo below shows, there is very little snow pack in the Sierras right now, way less than is typical for this time of year. 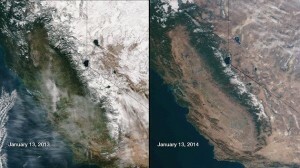 The satellite image on the right shows how things looked on 13 Jan, but is more reminiscent of late spring, when the only snow left is at the highest elevations, i.e., after the spring melt. So – the “50% of local water” certainly looks to be in serious jeopardy. What about the “40% from groundwater”? “We’re not panicking” says the local water agency. Is there any hope of change? Yes! First, a quick review. As I explained in this post, our flow pattern has now been locked in place for an incredible two months (roughly). The pattern has consisted of a strong ridge of high pressure over the west coast, and a companion trough of low pressure east of the Rockies. The western ridge has blocked rain-bearing storms from California, and has resulted in mild settled weather. 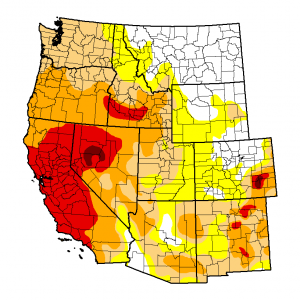 In fact, “mild” is an understatement as many high temperature records have fallen in the west. Local NWS offices have been posting these online, including from Sacramento and San Francisco/Monterey Bay. We’ve continued to experience a record number of “Spare the Air” days as slack winds cannot scour the air clear of pollutants. Much as we complain in the Bay Area, it seems to be worse in the Central Valley. East of us, the strong trough is still bringing wave after wave of very cold air and fresh snow. And west of us? The strong ridge steers storms north towards Alaska, but more significantly should be steering warm air north towards Alaska too, so we should expect to find stories about “unusual warmth” in AK. And sure enough…record warmth expected in Fairbanks! Of course, that means a high of just 40F! Rain fell along the (normally ice-cold) north slope of AK in December – very rare! What do the forecast models predict? Remember what we said in this blog about how we use models to forecast, and whether or not they are reliable. In that post, written on 8 Jan, the models predicted rain for 21 Jan – and that didn’t pan out did it! However, for several days now all models have been hinting at rain at the end of this week, AND a “pattern change”. This simply means that the “strong western ridge + deep eastern tough” pattern is forecast to break down. For storms and rain in the west, we need a trough to set up, and the models ARE predicting this! Further east, the deep trough is forecast to relax, which will bring an end to the bitter cold by the end of the week. So there is at least a little hope in sight! In the long term? As we discussed, forecasts beyond 10-14 days have little skill, so it’s not possible to say – with any confidence – whether the “pattern change” will stay, or whether the atmosphere will revert back to where it’s been for the last two months. As far as San Jose rain is concerned, think about this: suppose we get a quarter of an inch of rain every day in February. This would be more than a daily light rain shower, but less than a continuous downpour. At the end of February we would have received 7 inches of new rain – roughly half of what we get annually on average. This would certainly help! Heavy rain tends to fall so quickly that a lot runs off into the storm drains and out to the Bay. Thus we need moderate or steady rain that can soak into the groundwater storage system. In addition, if we were to get a series of “warm storms”, with relatively mild temperatures, the Sierras would receive more rain than snow – snow is preferred so that the reservoirs can fill up during the melt season. So – keep you eyes glued to the forecast products, and cross your fingers that we get a pattern change which ushers in a strong of storms bringing rain to the lowlands, and snow to the mountains! Why the chilly nights? Dry air! 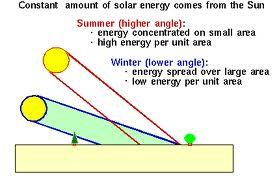 As a result, the sun’s heating in winter (as it is now, supposedly!) is less effective than in summer. Because of these two factors (and some others), our days are cooler in winter. But what about our nights? At night after the sun has set, there is no more heating coming in from the sun and we begin to cool. This cooling is accomplished via the physical process know as radiation. Warm air down near the ground radiates energy upward, and as a result that air cools. Worst-case scenario is that ALL this energy radiates upward out into space. If that were to happen, the atmosphere would be much colder than it actually is. But instead, molecules within the atmosphere actually absorb that outgoing radiation and thus prevent its loss. In this way, the atmosphere serves as a “blanket”, preventing heat loss. The physics of this was developed starting in the early 1800’s – well over a century ago! Along the way, the effect came to be known as the Greenhouse Effect – read the history section here! Scientists have calculated the impact of the greenhouse effect – it warms us by roughly 60 deg F! In other words, without the greenhouse effect, the air would be about 60 deg colder than now. It would be more like living on Mars! So what are these mysterious molecules within the atmosphere responsible for the greenhouse effect – and how does this explain our chilly nights? The most famous greenhouse gas is carbon dioxide, the object of much attention. But the most effective greenhouse gas is – water vapor! On any given night, the presence of water vapor in the air above us prevents heat loss – keeping us warm. Well, maybe not “warm”, but definitely warmer than we otherwise would be. On the other hand, on a night when the air is very dry (low water vapor content, low relative humidity), the greenhouse effect is much less efficient, allowing overnight temperatures to drop. If you’ve ever been out in the desert, you know that it can be very hot during the day (over 100 deg F, say), and amazingly cold at night (50 deg F or lower)! The desert is a place where it hardly ever rains, and there is usually very little moisture in the air. So at night? Rapid cooling! The opposite is true in humid locations: overnight temperatures don’t drop anywhere near as much. This week (Jan 13-17, 2014) in San Jose, the forecast calls for offshore winds, meaning winds flowing from east to west. This leads to drying as air flows down from the Sierras. The dry air means we can forecast two things: (1) chilly overnight lows, as explained above; and (2) high fire danger – not good in January. Comments Off on Why the chilly nights? Dry air! In modern times, we use sophisticated computer models to simulate the current and future (forecast) state of the atmosphere. This field is known as Numerical Weather Prediction (NWP), and meteorologists have been developing and improving NWP techniques for over 60 years now. Close cousins of these models are also used to simulate the climate, and determine how it will change as greenhouse gases build up in our atmosphere. Many developed countries have NWP models, and forecasters with the National Weather Service (NWS) generally look at the forecasts generated by many models. This tells the forecaster whether there is any consensus for a certain forecast. 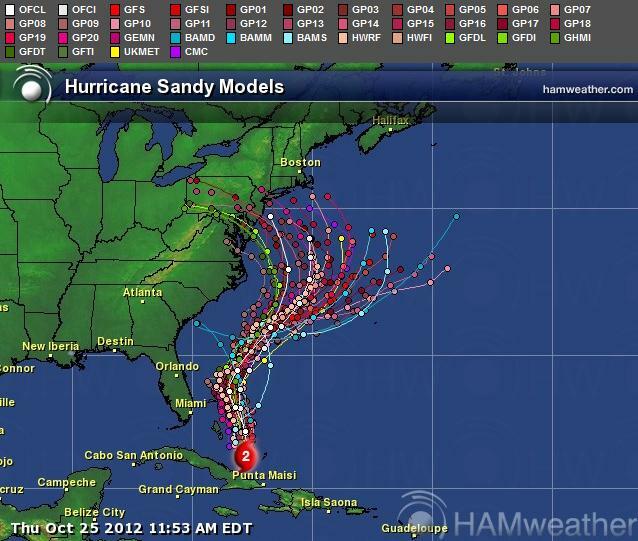 As we all remember from 2012, multiple models forecast the northward movement of Hurricane Sandy, but there were substantial model differences in exactly where and when the storm would make landfall, if at all – the map below shows the wide range! On that occasion, the European model appeared to produce the best forecast. The main models used in the US are: the Global Forecast System (GFS) model and the North American Model (NAM), both of which forecast for the entire planet; and the Weather Research and Forecasting Model (WRF – pronounced “WORF”), which produces forecasts for limited regions such as the Bay Area. Forecasts produced by all of these are processed at SJSU and then posted online at our Weather Center page. Right now – in the middle of our really long, dry period – all of us check model forecasts every day to see if there is any chance of rain. And thus far, as we all know – nothing. But – an interesting pattern has been noted! Every time we have checked – for at least as far back as Thanksgiving! – the forecast has been roughly the same: dry this week, rain returning next week or the week after. As you all know, this hasn’t worked out at all well! When models get the forecast right, we say that they have “verified”, but lately – they haven’t. So today, 8 Jan 2014, the GFS model again has us dry all the way out to 18 Jan, except for maybe a light sprinkle over the upcoming weekend. After the 18th, the model is trying again to make it rain here! It’s forecasting rain on the 18th and again the 20th. It really IS interesting how the models are constantly forecasting that the big, bad ridge offshore (see my blog on 1/6/14 on our “Crazy Winter Weather” about ridges) is going to break up soon. It’s just as interesting as the fact that the ridge has been stuck out there, blocking storms from bringing our winter rain, for almost 2 months now!! Here’s the forecast for rain on the 20th (PST). The yellow and green splashes show regions where the model forecasts that rain will have fallen within the previous 12 hours. As you can see, the model is forecasting a storm moving onshore in northern California, with rain spreading in over the Bay Area! Will this forecast verify? Probably not! Meteorologists have established that the forecasts beyond about 10-14 days generally have little accuracy, although forecast accuracy has improved measurably in the last 60 years! However, we now understand that atmospheric behavior is a chaotic, and hence unpredictable beyond 10-14 days given our current state of knowledge of chaos. Incidentally, did you know that one of the founders of chaos theory was Dr. Ed Lorenz of MIT – a meteorologist! So, we probably can’t trust the GFS forecast, but you can follow the progress of the forecast of rain around the 21st by checking back to this page daily, and seeing if the forecast of rain is still on track! Fingers crossed!! Comments Off on Forecasting rain! Look out everybody!!! The Polar Vortex is coming!!! If you’ve been paying any attention to the news today (1/6/14), you might be forgiven for believing this warning: “Look out everybody!!! The Polar Vortex is coming!!!“. But relax – the Polar Vortex has been here since well before you were born! Let’s examine the Polar Vortex! either: if you look at the air flow in the layer we call the stratosphere (see more below), you’d see a vortex of air circulating around the pole. Seen from above, the vortex would swirl counterclockwise on most days. Wind speeds could be as high as about 200 mph in the core of the flow! This is the phenomenon meteorologists call the Polar Vortex. The flow is usually not be in a straight line from west-to-east: rather, it would have one to three large “bends”, where the flow heads towards the northeast or southeast before flowing due east again. Meteorologists have determined that these undulations are caused by the Earth’s underlying terrain, especially by the big mountain ranges such as the Rockies. The flow undulations are also caused by the temperature gradients between the great oceans and continental land areas. The oceans are warm in winter relative to the land, and cold in summer relative to the land, and these temperature differences cause deflections in the air flow! The Polar Vortex has been studied and observed for some time now. It extends up to an altitude of around 50 miles above the land. In winter, the flow is counterclockwise (when viewed from above the pole), but in summer it reverses! Occasionally in winter it also reverses quite suddenly during an event known as a Stratospheric Sudden Warming. The stratosphere is the layer of the atmosphere from about 6-30 miles about the surface. At cruising altitude on a commercial airplane flight, you are flying in the stratosphere! It’s also the layer that contains the Ozone layer and the Ozone hole. or: if you look at the air flow in the lowest layer of the atmosphere – the troposphere – you would again see a vortex of air circulating around the pole. This flow is not quite the same as the Polar Vortex, although the two are linked. We mostly refer to this as the Jet Stream. The Jet Stream flow is always west to east, whereas the Polar Vortex changes direction from winter to summer. Just as with the Polar Vortex, the flow has northward and southward meanders in it, large and small. The northward meanders are called ridges, and they bring calm, settled weather to regions under the ridge. The southward meanders are called troughs, and they are often associated with wet, windy, cloudy, stormy weather. The troughs and ridges generally move from west to east, but sometimes they get “stuck”. When this happens, our weather pattern also gets stuck. For those of us in California, we have been stuck under a ridge for weeks (months?? ), and are experiencing an unprecedented dry fall and year as a result. In addition to sometimes locking into place and not moving, the troughs and ridges can sometimes be very strong (“high amplitude”). This causes excessive northward deflection of air moving “over” a ridge. When this happens over the north Pacific, for example, warm air can be diverted into Alaska, resulting in warmer-than-normal conditions for them. On the other hand, when there is a particularly deep trough there will be an excessive southward deflection of air moving “under” the trough. When this happens over the Midwest, as is the case right now, cold Arctic air can be diverted way south towards the Gulf Coast states. 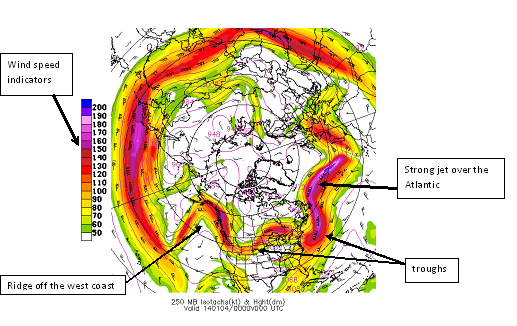 The image below (taken from our earlier post) shows an example of the Jet Stream flow in the troposphere. This was on Saturday 4 January 2014, and shows the winds in the upper troposphere. The view is from above the pole, which is in the center of the picture (with the USA below it in the picture). The red and purple shading shows where the strongest winds are, and you can follow around the hemisphere to see where the Jet Stream is located. Note the very strong winds over the Atlantic and the Pacific! The very cold outbreak east of the Rockies is associated with the troughs indicated there. So in summary, to most meteorologists, the Polar Vortex refers to air flow up in the stratosphere and above. It’s been there for as long as our atmosphere has been behaving the way it does today – so certainly for tens of thousands of years! It absolutely does behave somewhat differently from year to year, and has an occasional “breakdown”! But it’s not something new that just developed over the past few weeks…so relax!!! Comments Off on Look out everybody!!! The Polar Vortex is coming!! !